Philocrites: Better rain than snow? Am I testing Flickr — or am I testing my endurance of this endless rain? I think I preferred the snow. 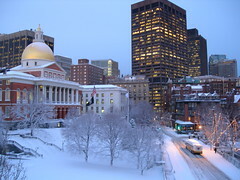 So, waxing nostalgic, here's the view from my office window at the end of a day of heavy snow in Boston last December 9. I am thinking of snow, of course, because Mrs Philocrites and I have put away our winter coats, gloves, and hats four times this spring only to bring them out again three times. We wish we had done it again today. We went out after church to see the David Hockney portraits at the MFA — on the last day of the exhibition, naturally — and were soaked and shivering by the time we got to the bus. The exhibit warmed us right up, but not even great art can obscure the fact that it's miserable out there. Next: This week at uuworld.org: Mary Magdalene.